Lacquer is a clear or coloured wood finish that dries by solvent evaporation or a curing process that produces a hard, durable finish. This finish can be of any sheen level from ultra matte to high gloss, and it can be further polished as required. 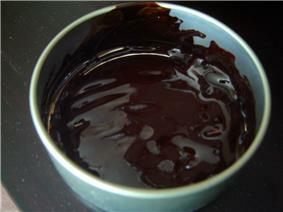 It is also used for "lacquer paint", which is a paint that typically dries better on a hard and smooth surface. The term lacquer originates from the nitrocellulose, and later acrylic compounds dissolved in lacquer thinner, a mixture of several solvents typically containing butyl acetate and xylene or toluene. Lacquer is more durable than shellac. In the decorative arts, lacquer or lacquerware refers to a variety of techniques used to decorate wood, metal or other surfaces, especially carving into deep coatings of many layers of lacquer. The archaic French word lacre "a kind of sealing wax", from Portuguese lacre, unexplained variant of lacca "resinous substance", from Arabic lakk, from Telugu లక్క Persian lak, the verb lac meaning "to cover or coat with laqueur". The root of the word is the Sanskrit word lākshā' (लाक्षा), which was used for both the Lac insect (because of their enormous number) and the scarlet resinous secretion it produces that was used as wood finish in ancient India and neighbouring areas. Lac resin was once imported in sizeable quantity into Europe from India along with Eastern woods. Urushiol-based lacquers differ from most others, being slow-drying, and set by oxidation and polymerization, rather than by evaporation alone. In order for it to set properly it requires a humid and warm environment. The phenols oxidize and polymerize under the action of an enzyme laccase, yielding a substrate that, upon proper evaporation of its water content, is hard. These lacquers produce very hard, durable finishes that are both beautiful and very resistant to damage by water, acid, alkali or abrasion. 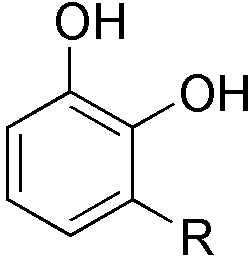 The active ingredient of the resin is urushiol, a mixture of various phenols suspended in water, plus a few proteins. The resin is derived from a tree indigenous to China, species Toxicodendron vernicifluum, commonly known as the Lacquer Tree. The fresh resin from the T. vernicifluum trees causes urushiol-induced contact dermatitis and great care is required in its use. The Chinese treated the allergic reaction with crushed shellfish, which supposedly prevents lacquer from drying properly. 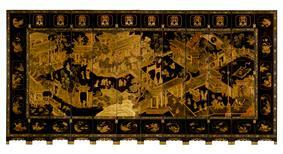 Lacquer skills became very highly developed in Asia, and many highly decorated pieces were produced. During the Shang Dynasty (1600–1046 B.C. ), the sophisticated techniques used in the lacquer process were first developed and it became a highly artistic craft, although various prehistoric lacquerwares have been unearthed in China dating back to the Neolithic period and objects with lacquer coating in Japan from the late Jōmon period. The earliest extant lacquer object, a red wooden bowl, was unearthed at a Hemudu culture (5000-4500 B.C.) site in China. By the Han Dynasty (206 B.C. – 220 a.C), many centres of lacquer production became firmly established. The knowledge of the Chinese methods of the lacquer process spread from China during the Han, Tang and Song dynasties, eventually it was introduced to Korea, Japan, Southeast and South Asia. There are two types of lacquer in India: one obtained from the T. vernicifluum tree and the other from an insect. In India the insect lac was once used from which a red dye was first extracted, later what was left of the insect was a grease that was used for lacquering objects. Trade of lacquer objects travelled through various routes to the Middle East. Known applications of lacquer in China included coffins, music instruments, furniture, and various household items. 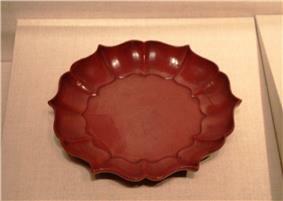 Lacquer mixed with powdered cinnabar is used to produce the traditional red lacquerware from China. 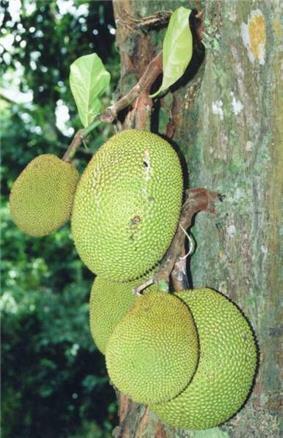 Lacquer-yielding trees in Thailand, Vietnam, Burma and Taiwan, called Thitsi, are slightly different; they do not contain urushiol, but similar substances called "laccol" or "thitsiol". The end result is similar but softer than the Chinese or Japanese lacquer. Unlike Japanese and Chinese Toxicodendron verniciflua resin, Burmese lacquer does not cause allergic reactions; it sets slower, and is painted by craftsmen's hands without using brushes. A Chinese lacquer coffin decorated with birds and dragons, from the State of Chu, 4th century B.C. R = (CH2)7CH=CHCH2CH=CHCH2CH=CH2 and others. The processed form (in which the lacquer is stirred continuously until much of the water content has evaporated) is called guangqi (光漆) in Chinese but comes under many different Japanese names depending on the variation, for example, kijiro-urushi (木地呂漆) is standard transparent lacquer sometimes used with pigments and roiro-urushi (黒呂色漆) is the same but pre-mixed with iron hydroxide to produce a black coloured lacquer. 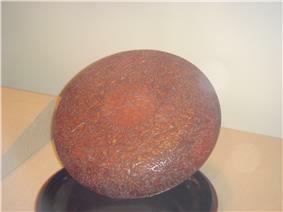 Nashiji-urushi (梨子地漆) is the transparent lacquer but mixed with gamboge to create an even clearer lacquer and is especially used for the sprinkled-gold technique. These lacquers are generally used for the middle layers. Japanese lacquers of this type are generally used for the top layers and are prefixed by the word jo- (上) which means 'top (layer)'. Slow-drying solvent-based lacquers that contain nitrocellulose, a resin obtained from the nitration of cotton and other cellulostic materials, were developed in the early 1920s, and extensively used in the automobile industry for 30 years. Prior to their introduction, mass-produced automotive finishes were limited in colour, with Japan Black being the fastest drying and thus most popular. General Motors Oakland automobile brand automobile was the first (1923) to introduce one of the new fast drying nitrocelluous lacquers, a bright blue, produced by DuPont under their Duco tradename. These lacquers are also used on wooden products, furniture primarily, and on musical instruments and other objects. Nitrocellulose lacquers are also used to make firework fuses waterproof. The nitrocellulose and other resins and plasticizers are dissolved in the solvent, and each coat of lacquer dissolves some of the previous coat. These lacquers were a huge improvement over earlier automobile and furniture finishes, both in ease of application and in colour retention. The preferred method of applying quick-drying lacquers is by spraying, and the development of nitrocellulose lacquers led to the first extensive use of spray guns. Nitrocellulose lacquers produce a hard yet flexible, durable finish that can be polished to a high sheen. Drawbacks of these lacquers include the hazardous nature of the solvent, which is flammable and toxic, and the hazards of nitrocellulose in the manufacturing process. Lacquer grade of soluble nitrocellulose is closely related to the more highly nitrated form which is used to make explosives. They become relatively non-toxic after approximately a month since at this point, the lacquer has evaporated most of the solvents used in its production. Due to health risks and environmental considerations involved in the use of solvent-based lacquers, much work has gone into the development of water-based lacquers. Such lacquers are considerably less toxic and more environmentally friendly, and in many cases, produce acceptable results. More and more water-based coloured lacquers are replacing solvent-based clear and coloured lacquers in underhood and interior applications in the automobile and other similar industrial applications. Water based lacquers are used extensively in wood furniture finishing as well. Just as china is a common name for porcelain, japanning is an old name to describe the European technique to imitate Asian lacquerware. As Asian lacquer work became popular in England, France, the Netherlands, and Spain in the 17th century the Europeans developed imitations that were effectively a different technique of lacquering. The European technique, which is used on furniture and other objects, uses finishes that have a resin base similar to shellac. The technique, which became known as japanning, involves applying several coats of varnish which are each heat-dried and polished. In the 18th century, this type of lacquering gained a large popular following. Although traditionally a pottery and wood coating, japanning was the popular (mostly black) coating of the accelerating metalware industry. By the twentieth century, the term was freely applied to coatings based on various varnishes and lacquers besides the traditional shellac. The Hindu epic, Mahabharatha, describes the building of a house made of lac. Lakshagraha or Lakshagriha (Sanskrit: लाक्षागृहम्) (The House of Lacquer) is a book or parva from the Mahabharata, one of the two major Sanskrit epics of ancient India, the other being the Ramayana. This house was built under the orders of Duryodhana and his evil uncle and mentor Shakuni in a plot to kill the Pandavas along with their mother Kunti. The architect Purochana was employed in the building of Lakshagraha in the forest of Varnavrat. The house was meant to be a death trap, since lacquer is highly flammable. The plot itself was such that nobody would suspect foul play and the eventual death of the Pandavas would pass off as an accident. In the Mahabharata this incident is considered a major turning point, since the Pandavas were considered dead by their cousins, the Kauravas, which gave them ample opportunity to prepare themselves for an upcoming and unavoidable war. However, an escape route was prepared for the Pandavas who had been warned of the plot. Lakshgraha Varanavat, is located in modern-day Handia in Allahabad in Uttar Pradesh, India. The site at Varnavrat has since become a tourist location. ^ a b c d Webb, Marianne (2000). Lacquer: Technology and conservation. Oxford: Butterworth-Heinemann. p. 3. ^ Stark, Miriam T. (2005). Archaeology of Asia. Malden, MA : Blackwell Pub. Page 30. ISBN 1-4051-0213-6. ^ Wang, Zhongshu. (1982). Han Civilization. Translated by K.C. Chang and Collaborators. New Haven and London: Yale University Press. Page 80. ISBN 0-300-02723-0. ^ Institute of the History of Natural Sciences and Chinese Academy of Sciences, ed. (1983). Ancient China's technology and science. Beijing: Foreign Languages Press. p. 211. ^ The Black Lacquer Coffin Black Coffin Treasure, "The artistic design of the black lacquer coffin reflects the painting skills of the Western Han Dynasty. They often paint mystical and grotesque themes about their myth and legends. But through the technique which involve the use of embossing lacquer application..."
Paolo Nanetti (2006), Coatings from A to Z, Vincentz Verlag, Hannover, - A concise compilation of technical terms. Attached is a register of all German terms with their corresponding English terms and vice versa, in order to facilitate its use as a means for technical translation from one language to the other.